Obviously safe eco-driving is not only an important when driving clean vehicles, but also for conventionally fuelled buses in public transport. Also, safe eco-driving has more to it than saving energy or fuel – it also about safety. 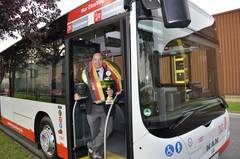 Salvatore Vancardo, an active bus driver of Duisburg’s public transport operator DVG (Duisburger Verkehrsgesellschaft AG), has proven he is among the best drivers in Germany when it comes to handling a huge bus. He has won the first place at the National Championships in road-safety training, which took place in Duisburg and was organised by the association of professional drivers in Germany (BDBK- Bund Deutscher Berufs-Kraftfahrer) together with their associated umbrella organisation BdBV. By winning the national championship Vancardo is automatically qualified for the World Championships 2014 in Poland. ACTUATE will approach the organisers of the German National Championships to discuss the idea of integrating an eco-driving module into the practical challenges. Also, there is the idea to organise a European eco-driving competition for clean buses (trolleybuses/ hybrid buses), which could for example be integrated into the European Trolleybus Day taking place in cities all over Europe in September 2014. ACTUATE will keep you updated on this!